On February 9th 2013 a coalition of civil society groups has called for an international day of action against Israeli agricultural companies in line with the Palestinian call for boycott, divestment and sanctions (BDS) against Israeli militarism, apartheid and colonisation. Corporate Occupation/Corporate Watch researchers are in Palestine collecting new information and over the coming weeks Corporate Watch will be writing a series of articles and blogs examining Israeli agricultural exports. 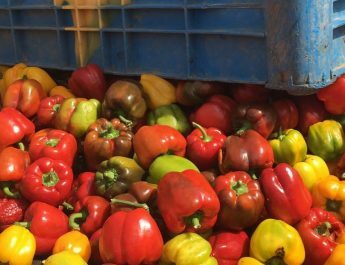 Corporate Occupation has obtained evidence that EDOM, a partly British owned agricultural export company, is still exporting fresh produce from the illegal settlement of Tomer. On Wednesday 16th January 2013 researchers acquired EDOM branded packaging which had been taken from Tomer settlement. The packaging had been mislabelled as coming from a kibbutz in 1948 Israel. The company director has previously pledged not to stock goods from the settlements. EDOM supply to several major British supermarkets, including Waitrose and Sainsburys, through the British company Valley Grown Salads, based in Essex. In 2010 Corporate Watch visited Tomer settlement and found evidence that EDOM, a company owned by three British companies, was exporting from Tomer. Researchers obtained boxes from a packing house in Tomer bearing the EDOM logo, photographed a truck bearing EDOM signage picking up goods from the settlement and a packing house bearing an EDOM sign. Corporate Watch wrote an open letter to Valley Grown Salads, a company which has part ownership of EDOM, pointing out that Tomer was established on Palestinian land, is illegal under international law and that the British government’s position is that Israeli settlements in the West Bank are unlawful (see the FCO website). In response Jimmy Russo, director of Valley Grown Salads (VGS) and Chairman of EDOM, pledged that EDOM and VGS would not trade with the settlements in the future. Despite the name, EDOM UK is an Israeli company. 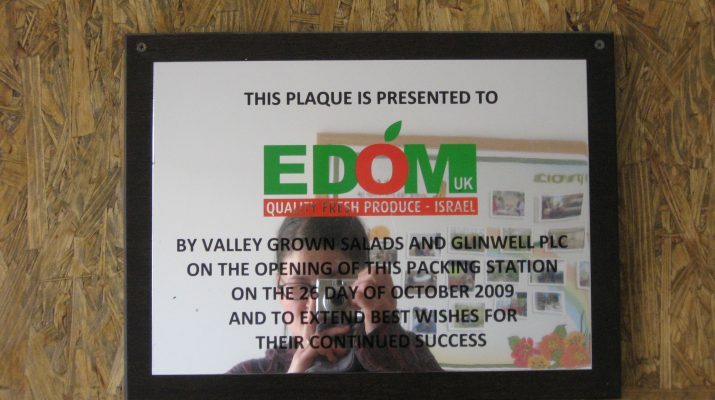 Valley Grown Salads (UK) own 20% of the shares in EDOM UK. Another British company, Glinwell PLC, own another 20%. 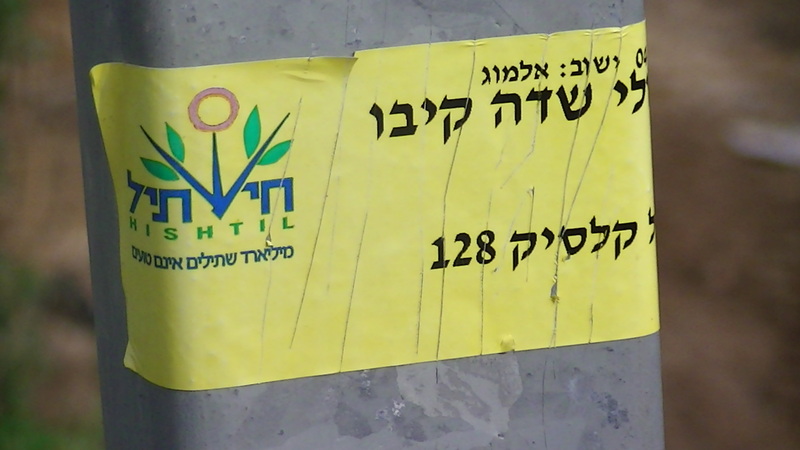 30% is owned by a company called Chosen Agricultural Products, which consists of farmers from Moshavs in the Arava region, and a further 30% by a company called Magnolia UK holdings (see here). Back in 2010 Russo told us that EDOM had been trading with a grower from Tomer called Yair Azoulay but had stopped working with him around three years before. However both Azoulay and a Yaron Yarchi, of EDOM in Israel, confirmed that there had been exports to Valley Grown Salads in the UK from Tomer. Now it seems that Russo and Valley Grown Salads have broken their promise not to stock from the settlements. It is of utmost importance that the BDS movement takes action against this company. Campaigners have spotted Waitrose trucks picking up products from the VGS depot in Essex as well as EDOM products on the shelves of Sainsburys’ stores. It is important that the movement acts to pressure these supermarkets not to stock goods from EDOM or VGS. Settlement expansion in the Jordan Valley is happening at the expense of Palestinian communities. While companies like EDOM UK, Mehadrin, and Agrexco make a profit out of the cheap Palestinian workforce the Israeli military is carrying out a campaign to drive communities out of the majority of the Jordan Valley to make way for Israeli annexation. Last week, on Thursday 17th January, 55 structures were bulldozed in the Bedouin community of Al Maleh, leaving the residents to sleep out in the open. When aid organisations provided tents, they were confiscated by the military and a Closed Military Zone was put in place preventing access to solidarity activists and journalists. Members of the community in Al Maleh started to erect their tents again this week. However, on the morning of the 24th the army returned and demolished a further two houses and two animal sheds. The soldiers told the villagers that if they tried to put their tents up again they would just demolish them again. One way that people can show solidarity with those suffering from the Israeli state’s policies of ethnic cleansing in the Jordan Valley is to take action against agricultural companies like EDOM and Valley Grown Salads that are profiting from these policies. 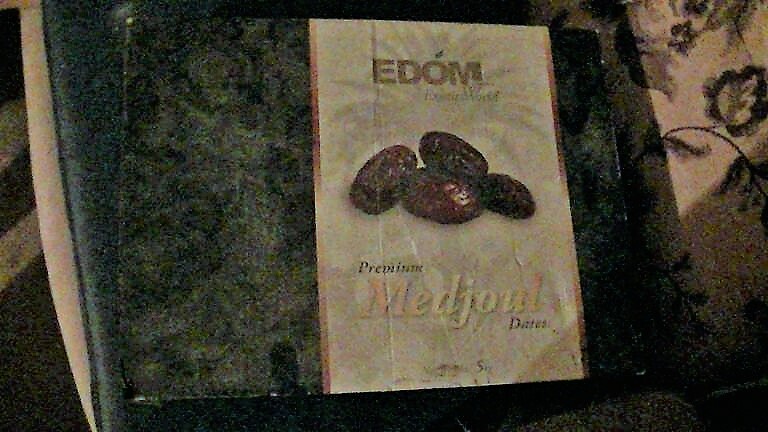 The Medjoul dates that Corporate Watch obtained in 2013 were labelled as coming from an address in the Galilee in Israel, Kibbutz Afikim, the head office of EDOM Fruits, despite the fact that the packaging was found in Tomer. “The Government considers that traders would be misleading consumers, and would therefore almost be certainly committing an offence, if they were to declare produce from the OPT (including from the West Bank) as ‘Produce of Israel’. This would apply irrespective of whether the produce was from a Palestinian producer or from an Israeli settlement in the OPT. This is because the area does not fall within the internationally recognised borders of the state of Israel.” (to read the full advice from DEFRA see here). I am from vancouver,canada and i just read about EDOM and the British Companys that buy their products.I haven’t seen any products from EDOM here in vancouver.I hope the people in England persuade supermarket owners not to buy products from EDOM.Keep up the good work.